I participated in a Influencer Activation on behalf of Influence Central for OshKosh B’Gosh. I received an OshKosh B’Gosh gift card to facilitate my post and a promotional item to thank me for my participation. I love any excuse to go shopping, don’t you? 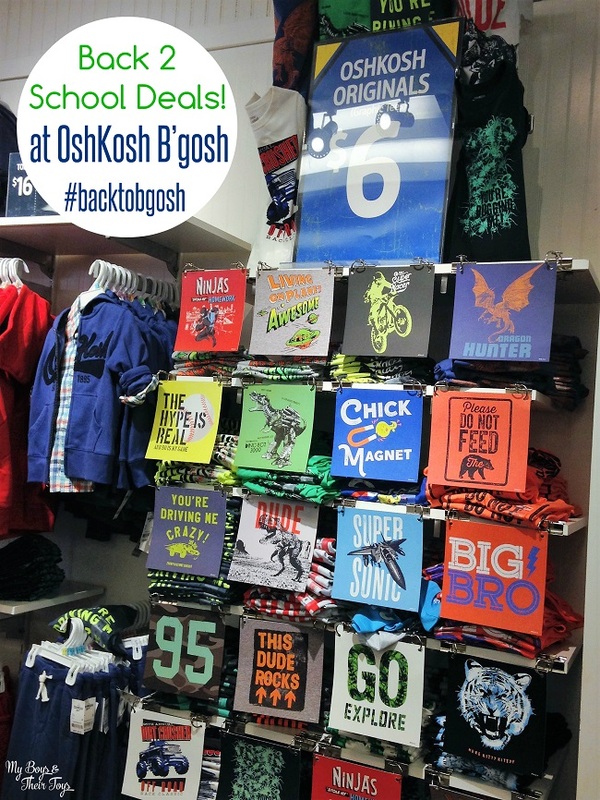 I always take the boys to OshKosh B’Gosh because they have the most fantastic sales, especially on back to school outfits! 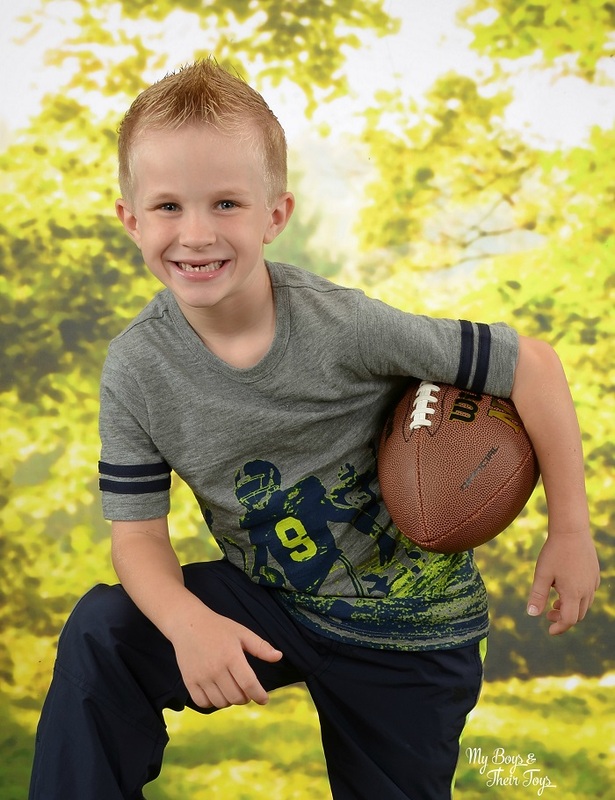 My older son, J, is into sports – as you’ll notice in his choices for back to school wear. Above he’s sporting a football tee and mesh lined track pants in navy with yellow stripes down the sides. It’s still pretty hot here in Florida, so we loaded up on $6 tees and mesh shorts so the boys stay comfortable and cool. 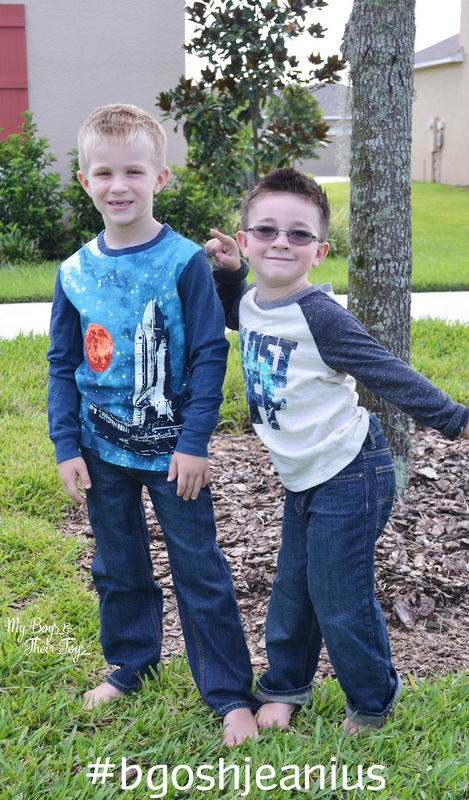 We also know that fall is on its way, which is why the boys picked out these glow in the dark space shuttle tees. They love visiting the nearby Kennedy Space Center with Angry Birds exhibit, so I wasn’t surprised that they were drawn to these shirts. We paired them with a classic favorite – OshKosh B’Gosh blue jeans. I love that they offer slim and husky sizes too! 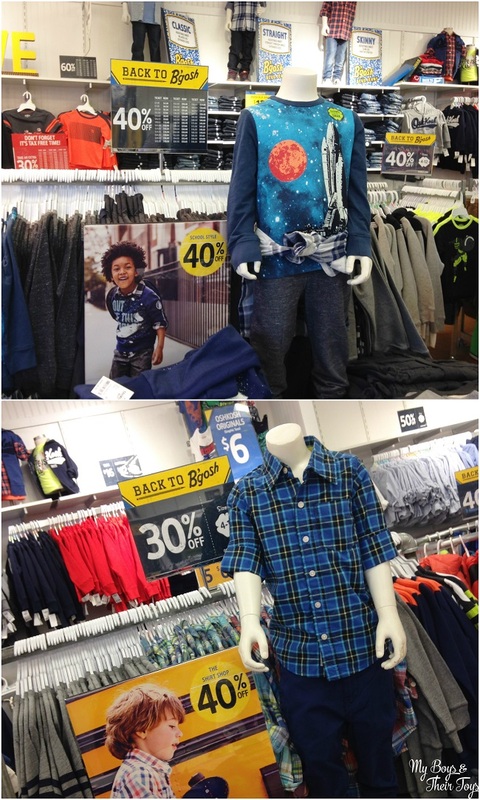 Shop in store to find great sales on back to school outfits now! OshKosh B’Gosh has must-haves for the season paired with modern heritage. Kids can sport bold prints or a touch of glow as they head to the school bus. Plus don’t forget fall is nearing, so stock up on B’gosh Blue Jeans that are back – and better than ever! 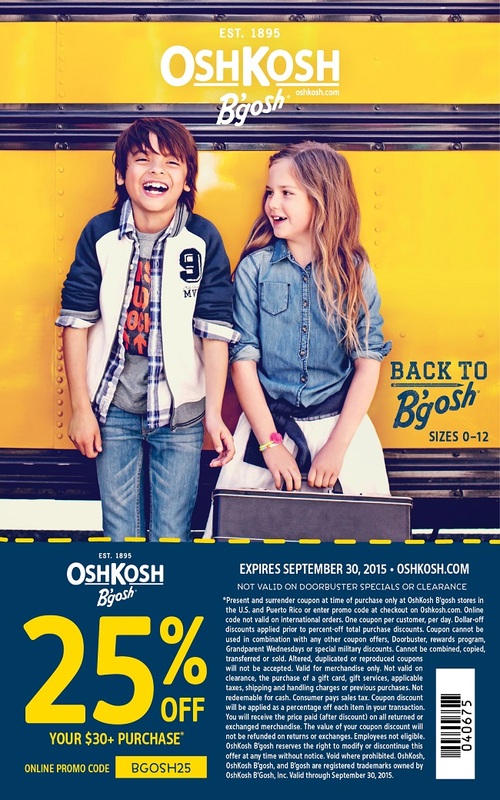 Keep reading to grab a OshKosh B’Gosh coupon! Show the coupon on your phone at the register to save. Give kids a leg up! OshKosh B’gosh has partnered with K.I.D.S./ Fashion Delivers, Inc., and DonorsChoose.org this back to school shopping season. Donate a new pair of blue jeans or make a cash donation at the register. All denim & cash donated from July 28 through September 16, 2015, will be delivered to local children in need. Now onto a delicious and easy after school snack idea! 1. Line a 9×12 pan with foil and spray with Pam. Set aside. 2. In a large sauce pan, melt butter over low heat. 3. And marshmallows to the melted butter, stirring constantly. 5. Using a rubber spatula, transfer the Rice Krispies to prepared pan and press down firmly and evenly. 7. With a metal spatula, loosen the Rice Krispies from the pan. Invert the Rice Krispies onto a plate. 8. Let cool completely before cutting into 8-12 even pieces. 9. Microwave 1/8 cup of Wilton red chocolate melts for 30 seconds. Stir until completely melted. Drizzle over three Rice Krispies bars. 10. Microwave 1/8 cup of Wilton blue chocolate melts for 30 seconds. Stir until completely melted. Drizzle over three Rice Krispies bars. 11. Microwave 1/8 cup of Wilton green chocolate melts for 30 seconds. Stir until completely melted. Drizzle over three Rice Krispies bars. 12. Microwave 1/8 cup of Wilton yellow chocolate melts for 30 seconds. Stir until completely melted. Drizzle over three Rice Krispies bars. 13. Before icing dries, firmly apply Wilton edible Apple decorations and ABC’s to each Rice Krispies bar. Find your OshKosh B’Gosh location here! We love shopping at OshKosh! I am there for my boys all the time. 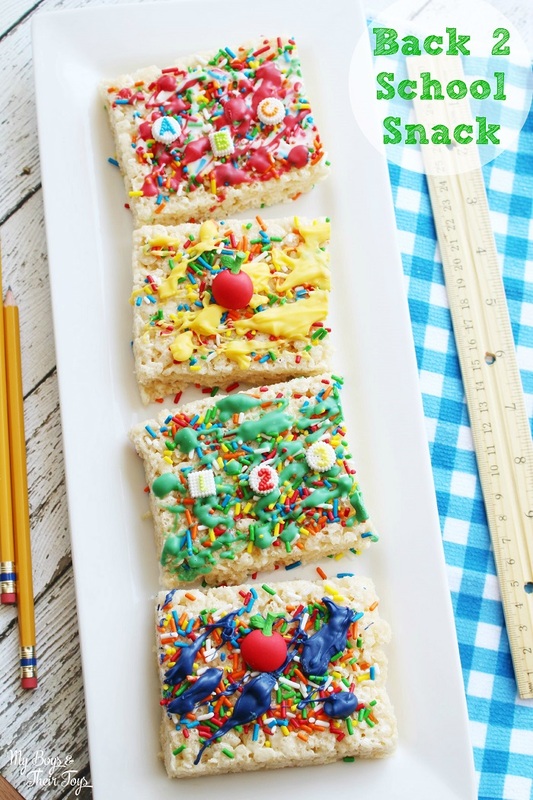 ABC Krispies, what a cute idea! I love OshKosh B’gosh! They have such great boys clothes that last a long time. 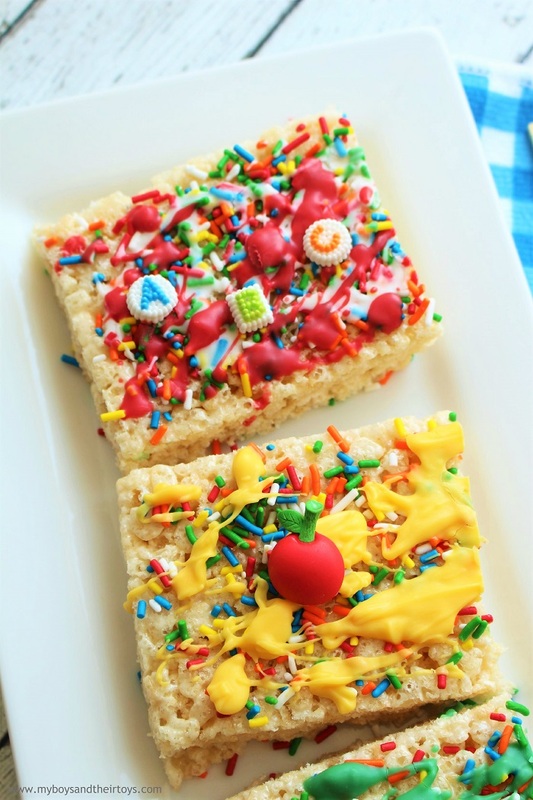 Love those ABC Krispie Treats. 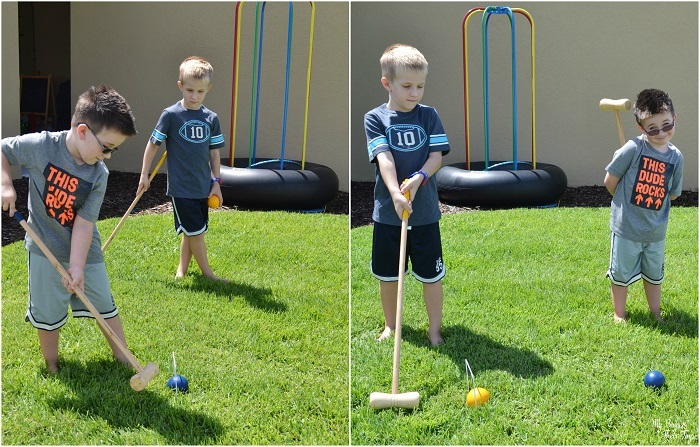 My boys have already asked me to make them! I love OshKosh B’gosh clothing! Your kids have great taste in clothes! Your kids look adorable! I want to make those RK treats for my kids! What cuties! They look perfect in their back to school looks. I need to head over & pick up the remaining bits of my kids’ wardrobes. I’m even more motivated with the coupon. We bought that Blast Off shirt!! Those snacks look really yummy! Those new outfits look great and so do the krispie treats. That’s an awesome coupon for back-to-school shopping! Adorable!! We love Osh Kosh too!! That snack look yummy! Oh I am loving that wall of graphic tees- that’s exactly what my son loves to wear! I love Osh Kosh. Those treats look delicious! Such cute outfits, I LOVE Osh Kosh! We have an outlet close to me and I shop there all the time!